I know that I just wrote to you a week ago, but yesterday -- and again today -- I’ve been surrounded by so many things that you would love that I need to give you a quick update. Yesterday -- thanks to Donnie C. Cutler’s mother, who invited me as her guest -- I attended the annual luncheon of the Jewish Women’s Archive. It was held in the big event room at the Museum of Jewish Heritage and had the weather been better (Did you forget to order up some good weather? ), we all would have been able to gaze out at your favorite lady in the harbor. Regardless of the weather, though, as I sat surrounded by nearly 300 or so amazing, powerful and empowered women (including a mother/daughter pair at my own table) I couldn’t help but think of you. For starters, just by chance, I found myself sitting next to Elinor Lipman, and I was reminded of The Inn at Lake Devine, which, at your urging, I read many years ago. Although I must admit that I don’t remember a lot of the specifics of the story, I do recall LOL’ing (that expression probably wasn’t even around when we read the book!) at so much of what went on in those pages. (I also have to admit that more than once I wondered how many women in the room were BRCA+....and of that number how many don’t know it. But that’s a letter for another time...) Three women were honored during the program--Elizabeth Sackler, Letty Cottin Pogrebin and Rebecca Traister--and each was introduced by Gloria Steinem! You would have loved it, and I definitely felt your spirit in the room with us. In the honorees’ remarks, there were repeated references to Emma Lazarus, the Statue of Liberty, the immigrant experience, and their own mothers. Oh, how I missed you... More than once, I had to take off my glasses to wipe my eyes. Today is the first full day of the CCAR convention in Boston and of course I’m not there, but a few of my friends (and yours, too) who are there are posting pictures on Facebook. At t’filah this morning in honor of the 40th anniversary of women in the rabbinate, Rabbi Sally Priesand read Torah, surrounded by the female leadership of the CCAR. (Do you remember how long the cover of People magazine with her picture on it hung on the wall in my bedroom? I don’t think I took it down until I went away to college...more than a dozen years after her ordination.) 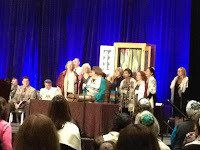 Rabbi Phyllis Sommer noted in her post, that this is “a proud and wonderful moment for ALL of us,” and Rabbi Michelle Pearlman (now at Monmouth Reform) called it a “remarkable moment.” True on all counts...and this, too, you would have loved! I guess you would love all of these things because you were such an amazing woman yourself. And, when I think you’re missing things that you would love is when I miss you the most. But then again, maybe you’re not missing them at all. Perhaps you’re looking down and loving them from wherever you are. If so, I hope you’re catching all these goings-on and loving them as much as I am.